We are a prime Manufacturer, Exporter and Supplier of Rose Oil. We offer pure quality Rose Oil, which is extracted with the process of distillation. Steam distilled, Rose Essential Oil offered has anti oxidant properties and is mostly used in crèmes. The presence of rapidly absorbed anti-oxidants and active ingredients makes the oil perfect to be used as a moisturizing day cream. Other than this, it is also used in soaps, cosmetics, toiletries and perfumes. Rose is a member of the Rosaceae family. We manufacture best quality of rose oil by steam distillation of fresh flower petals. The pure absolute or essential oil’s ranges in color from various shades of pale yellow to olive yellow, and it congeals to a waxy thickness when cooled below room temperature. Blend with - Bergamot, clary sage, geranium, chamomile roman, jasmine, lemon, lavender, mandarin, neroli, petitgrain, patchouli, sandalwood, vetiver, ylang ylang . Constituents - Citronellol, geraniol, Phenyl ethyl alcohol. Uses : It has antidepressant, antichloristic, anti-infectious, antiseptic, aphrodisiac, antiviral, astringent, choleretic, bactericidal, haemostatic and laxative properties. A regulator of appetite, it also acts as a sedative (nervous), tonic (heart, liver, stomach and uterus) and stomachic. Further, it is also helpful against dry skin, emotional crisis, eczema, headache, impotence, insomnia, liver congestion and other ailments. Benefits : It regulates hormone production and helps to balance them throughout the body. It is one of the best oils to give you shining, fresh and youthful skin. Its aroma keeps you charged and feeling happy. It promotes circulation, takes care of the heart, reduces blood pressure and helps to cure headaches, asthma, dehydration, leucorrhea and various other infections. Appearance - Light yellow, occasionally slight greenish, Transparent. 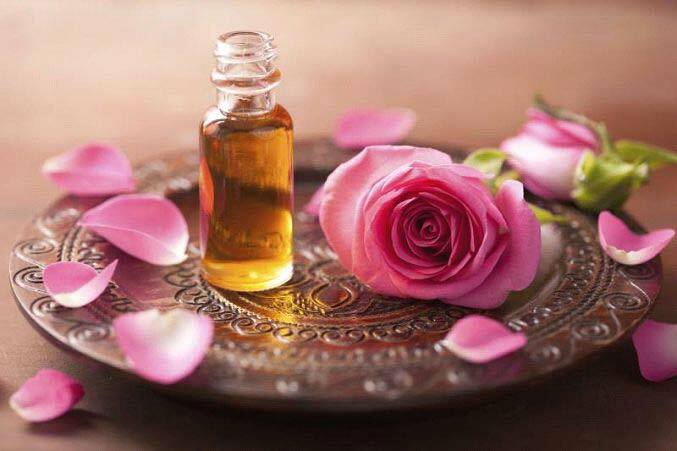 Properties- True rose oil is a light yellow, occasionally slight greenhs and semi soli at room temperature. The odour of the rose oil is very pleasant, powerful and characteristic of fresh rose and the flavour is sweet and somewhat honey- like.